A full coverage lace triangle bra with a romantic floral print. V-neck Adjustable shoulder straps Pullover style Lace trim Soft cups Polyamide/elastane Hand wash Made in Italy. Lingerie - Cosabella. Cosabella. Color: Jolie Print. Size: Large. A full coverage lace triangle bra with a romantic floral print. V-neck Adjustable shoulder straps Pullover style Lace trim Soft cups Polyamide/elastane Hand wash Made in Italy. Lingerie - Cosabella. Cosabella. Color: Jolie Print. Size: Medium. A full coverage lace triangle bra with a romantic floral print. V-neck Adjustable shoulder straps Pullover style Lace trim Soft cups Polyamide/elastane Hand wash Made in Italy. Lingerie - Cosabella. Cosabella. Color: Jolie Print. Size: Small. 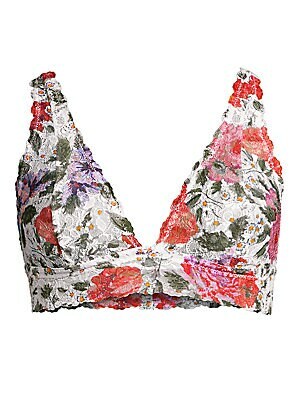 A full coverage lace triangle bra with a romantic floral print. V-neck Adjustable shoulder straps Pullover style Lace trim Soft cups Polyamide/elastane Hand wash Made in Italy. Lingerie - Cosabella. Cosabella. Color: Jolie Print. Size: XS. An updated style that's lighter, stretchier and softer than before. Cotton gusset Polyester Hand wash Made in Italy. Lingerie - Cosabella. Cosabella. Color: Black. An updated style that's lighter, stretchier and softer than before. Cotton gusset Polyester Hand wash Made in Italy. Lingerie - Cosabella. Cosabella. Color: Blush.